Hsu Shen-chou was born in Puzhi, Taoyuan in 1918. He was originally named “Chin.” “Shen-chou” was given by the artist’s instructor Lu Tieh-chou. The artist graduated from the Taipei Private High School. During high school years, he was first instructed by western painter Chien Chuo-ran (1903-1993) before learning with Lu Tieh-chou at the Nanming Painting Studio. The artist was selected for the 10th “Taiwan Fine Arts Exhibition” with Breadfruit Trees. As the “Taiwan Fine Arts Exhibition” became the “Taiwan Governmental Fine Arts Exhibition,” he was selected for the 1st-5th “Taiwan Governmental Fine Arts Exhibitions.” During the Japanese Rule, the artist used a pseudonym “Ke She-chou” while participating in exhibitions. It was only after the end of the war that the artist resumed his original family name. With Monkeys, he was awarded the Special Selection Prize at the 1st “Taiwan Provincial Fine Arts Exhibition.” He was the Special Selection Prize winner again at the 2nd and 3rd “Taiwan Provincial Fine Arts Exhibition.” Because of his excellent performance, he was given special access to the exhibition, displaying his works yearly without having to pass qualification reviews in advance. At a later stage, he became a reviewer himself at the “Taiwan Provincial Fine Arts Exhibition” and “Teachers’ Art Exhibition.” He was a teacher at the Taipei Private High School, Taipei Municipal Girl’s High School and Provincial Taoyuan Senior High School. He actively participated in the promotion and education of gauche painting, founding the Taiwan Provincial Gauche Painting Association in 1982. He also founded the Lu-Shui Painting Society in 1991 to boost the development of gauche painting in northern Taiwan. He was a member of the Chingyun Art Society, Chang-Liu Painting Society and Tai-yang Arts Society. 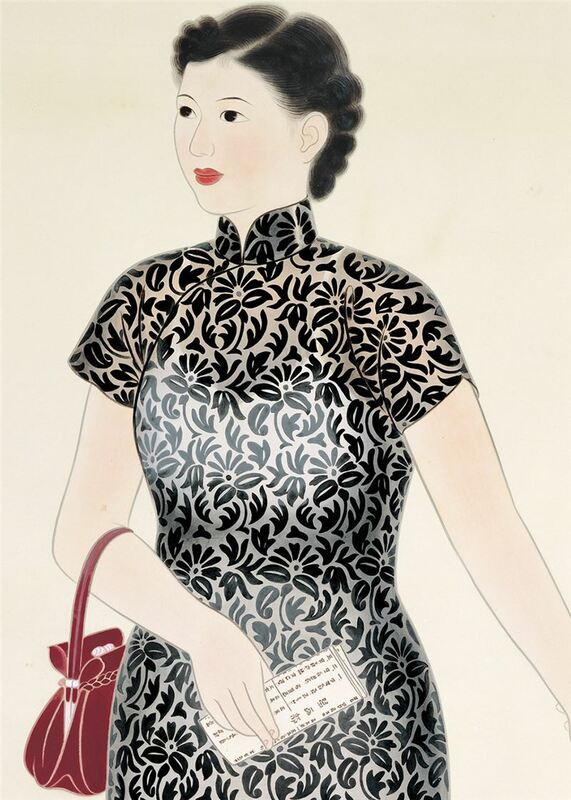 He inherited the fine painting style and truth-to-life spirit of Lu Tieh-chou. 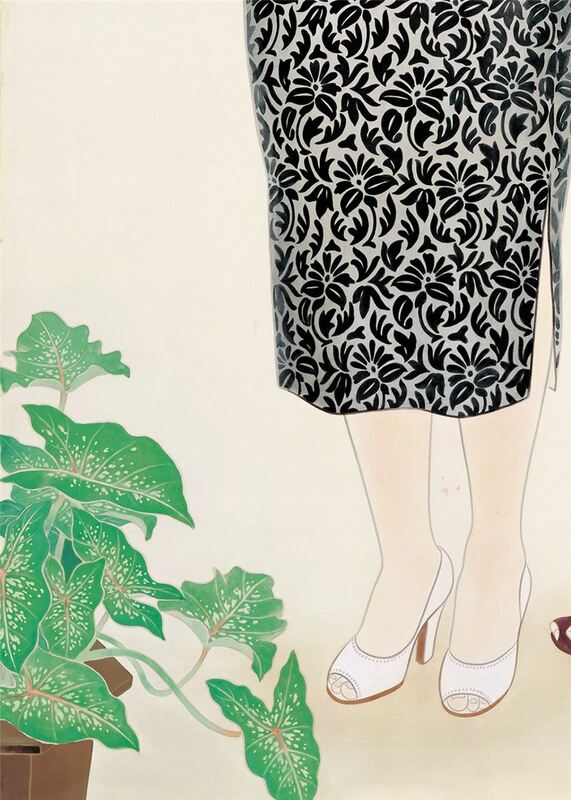 Many of his works from the Japanese Rule are featured by flowers and birds, while his post-war creations are mainly about women’s lives in Taiwan. The figures in his paintings full of colors and somewhat decorative, the mountains look solid and powerful, while the flowers are delicate and graceful. Most of his painting subjects are taken from life. His works are simple, amiable and resonating. 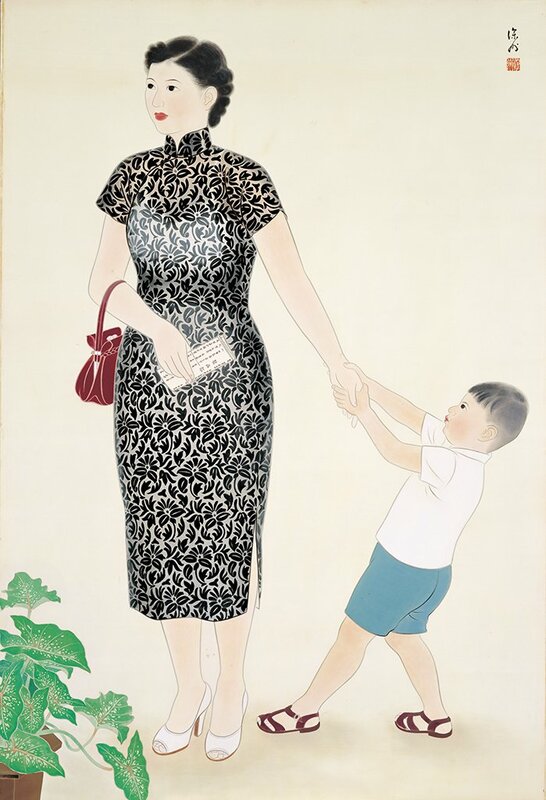 Mother & Child in an Art Exhibition, released at the 10th “Taiwan Provincial Fine Arts Exhibition” in 1955, was hailed by critic Wang Pai-yuan for its “tender color hues and diversified expressions of light and shades on garments. 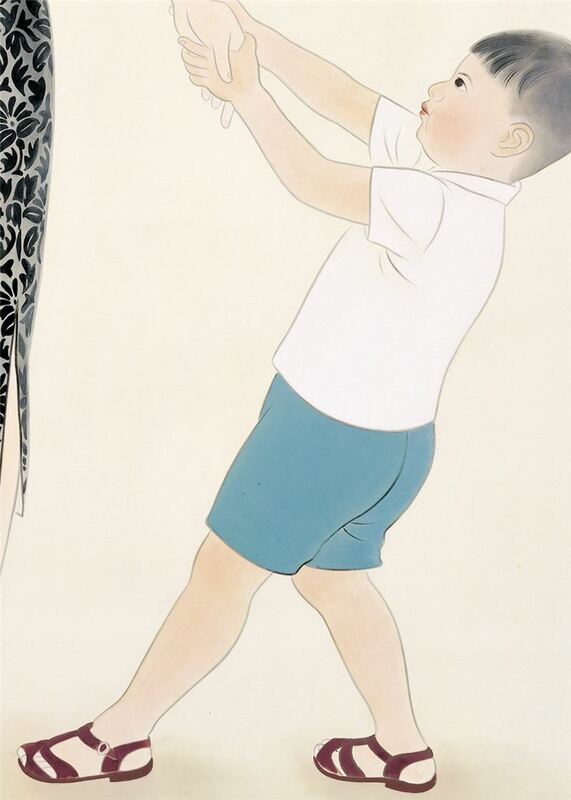 This painting has been carefully choreographed.” The dismayed child, pouching his lips, wants to go the other way by pulling his mother’s hands. His mother, however, is so attracted to the painting that she simply wouldn’t move. The triangle composition creates an intriguing tension between the two figures. This painting shows the artist’s trademark observations skills and a graceful painting style. The style, texture and layered color hues of the woman’s garment are finely expressed here. Hsu used to study Toyo painting at the Nanming Painting Studio hosted by Lu Tieh-chou. Inheriting Liu’s contemporary aesthetics of the Maruyama and Shijo Schools, Hsu highly valued strict compositions and soft drawing lines and colors. Despite that after the war a long debate over which should be the authentic painting of Taiwan baffled the Toyo painters took place, Hsu actively participated in the “Taiwan Provincial Fine Arts Exhibition.” He started painting purely expressive ink paintings during this time, although his flower-and-bird paintings are still half expressive and half realist. He created a world where decoration and realism are one. Hsu started applying modernist techniques in the 1960s.The mountain walls and rigged rocks in his paintings are composed of simple geometric lines. In the 70s, he integrated gauche and ink painting, attaining an expressive and yet realist style.